The TowerRAID Plus TR8X+ and TR8X+B is equipped with a 2-port mini-SAS 6 Gbps PCIe 2.0 x8 controller card utilizing a new and more powerful RAID engine providing the best return on investment for your stringent IT dollar. The direct interface between the SAS or SATA HDD with the backplane also help to reduce latency and increase data transfer performance on the TR8X+ and TR8X+B. The TowerRAID Plus TR8X+/TR8X+B is compatible with Windows, Mac and Linux OS, providing a wide range of support under different operating systems. Both models are also supported in VMware for use as a centralized storage for ESX/ESXi server or by the virtual machines in VMware ESX/ESXi 4.0. 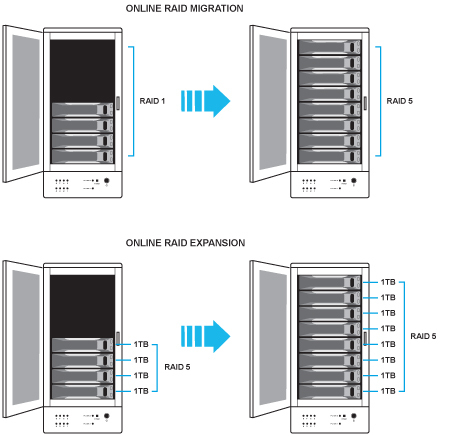 Utilizing dedicated high performance processor and advanced RAID design, TowerRAID Plus TR8X+ and TR8X+B is capable of real-time RAID mode alteration plus the hard drive capacity expansion without the need to erase existing data to provide maximum flexibility. This is also no need to move existing data to a temporary location. All changes are performed in the background without interrupting data availability. 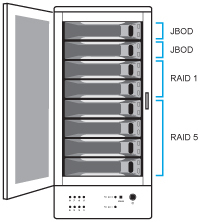 TowerRAID Plus series supports multiple RAID volumes where different RAID modes could be setup within a single unit allowing flexibility for various environments and applications. A multi-bay tower can also be divided into smaller volumes that could be operated and administrated individually. ​Built-in Web based GUI management tools provide all the necessary tools to create, manage and monitor your system. Enterprise-like features such as online RAID level migration, online RAID expansion, RAID roaming and Email notification for critical errors/events are also included via an user-friendly web GUI based management.